The "misuse" isn't making him regret the exclusive deal. Like every other large exclusive Epic has managed to wrangle, the Borderlands 3 announcement was met with a backlash and the review bombing of associated games on Steam. It's only convinced Gearbox CEO Randy Pitchford that 2K's decision to make the game a timed exclusive was the right one. Seeing the review bombing campaign on Steam made Pitchford "happy about 2K's decision," he said on Twitter. 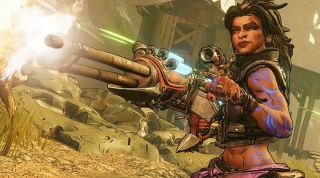 And while 2K publishes Borderlands, Gearbox also has its own publishing division, and its relationship with Steam may have to be reconsidered. The tweets were made on Friday, but the effect of these fake negative reviews has since been mitigated by Steam's off-topic review system. At a glance, the store pages for Borderlands and Borderlands 2 look like they did before the third game's announcement, but hovering over their score reveals that it's experienced "a period of off-topic activity" and that those reviews have been excluded from the store. It's not gone ignored by Valve, then, though a lot of games had to get hit before a solution appeared. With them hidden from the average Steam user, it may be that we see bombing campaigns start to wind down. Some proponents of review bombing say that it's a way to make their voice heard, and cite Rockstar and Take-Two agreeing not to target singleplayer mods with cease and desists as an example where it works, but in this case it's having the opposite effect. I've reached out to Gearbox Publishing to find out if this changes its plans on Steam.